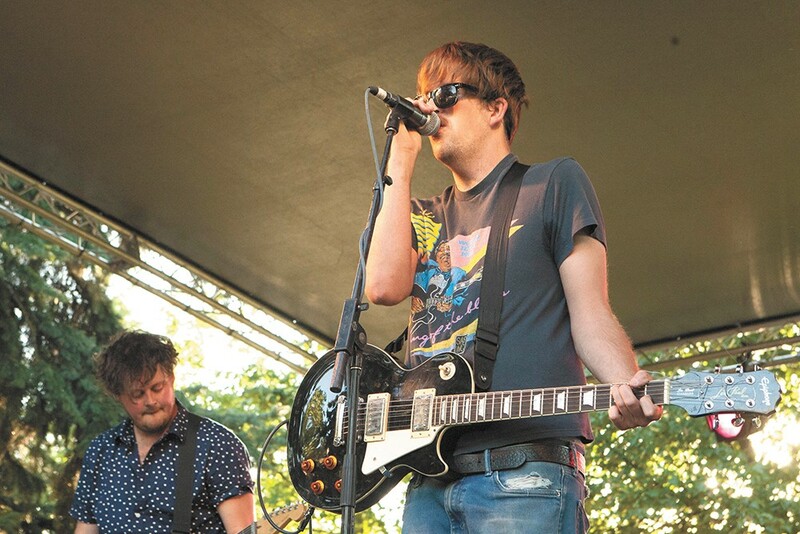 Pine League frontman Tyler Aker, right, and guitarist Scottie Feider at this year's Pig Out in the Park. Kneeling in the grass between Michael "Tambourine Man" Ransford's tight-white-jeaned legs, Tyler Aker rips on a guitar. Even with an awful cold, the Pine League frontman wouldn't miss playing Pig Out in the Park and wouldn't miss making a spectacle. "Tambourine Man smells really good," Aker says later in the beer garden, between sips of his Bud Light Straw-Ber-Rita. And that's where this four-piece party rock band succeeds; they're just here to have a damn good time at their shows. They've been playing up a storm this summer, with gigs all over town. They especially love the small venues where fans are in their faces and Aker has the chance to "roll on the ground." The group is so new that when they played Volume in May, they had just barely decided on a band name. But the veteran Spokane musicians have jelled cohesively, together settling into an entertaining mix of pop rock, punk and even Americana. To say they get along is an understatement. Aker and guitarist Scottie Feider are roommates, as are bassist Andy Bart and drummer Sam Stoner, who have played together in bands since 1999. Currently, this is their main band. Bart and Stoner are still part of The Lion Oh My, but since their lead singer left, that project has been in kind of a lull. With Pine League, they all say, there is no drama. Instead, they talk a lot about professional wrestling and make fun of each other. Sometimes they make music, too. "Spokane and its music scene is a great place to be based out of right now," says Aker, who moved back to Spokane from Seattle two years ago. When Aker first came home, everyone he knew was already in a band, so he just played solo. But last year, at a Mootsy's Thanksgiving show, the other guys all realized Aker needed a rock band behind his wailing, soulful vocals. Months later, they finally took action. At first it was just fleshing out Aker's originals, but soon songwriting morphed into a group effort. They even do a slowed-down version of the Pitbull/Ke$ha song "Timber." "My dad told us that was our best song," Feider says with a laugh. "Too bad it isn't ours."